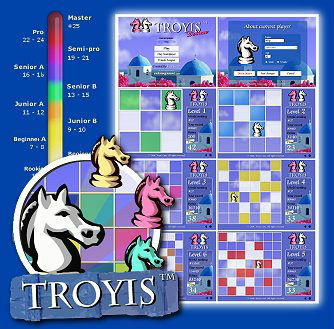 Welcome to Troyis™, probably the most simple, original and addictive puzzle game since Tetris! The funniest way to train your brain in minutes a day! Paint all the white cells on the board as quickly as possible, by way of the chess knight movement rule (L-shape). The faster you are, the more points and better world ranking you will get. When I found troyis I found some real stimulation! © 2019 Troyis.com - All rights reserved.